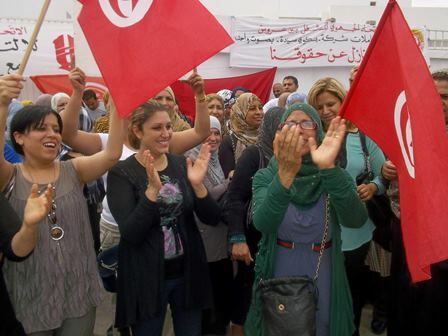 The workers at the Saida biscuit factory in Ben Arous, south of Tunis, walked out for three days to demand the implementation of agreements signed with management in March of this year. The local branch of the FGAT-UGTT at the Mondelez-SOTUBI joint venture is demanding, among other things, permanent employment for contract workers working in the company for over four years and overtime payment for drivers. The 3-day strike was announced after talks broke down on 12 June. Mondelez-SOTUBI workers on strike from 16-18 June 2014.